The members and families of Tierra Del Sol would like to invite you to our 57th TDS Desert Safari on March 1 – 3, 2019. Come out and experience the magic and splendor of southern California’s finest wheeling. This year will be another epic event with fantastic vendors onsite and the best raffle on the planet (over $150k in prizes)…Yes, we are going to do it again! TDS holds one of the largest weekend events and the proceeds assist us in fighting to keep Public Lands open. 1918 – With the end of World War I came the rapid popularity of automobiles. People started coming to the desert and the creation of the The Ensign Ranch and The Di Georgio Corporation started a new era in the region. 1928 – Already citizens were beginning to grow concerned about preserving the desert and Guy Fleming, a Fellow of the San Diego Natural History Museum, started promoting the adoption of Borrego as a State Park. 1941 – Finally the dream was realized and the Anza Borrego Park System was established, but that also brought developers with visions of a desert resort and that required roads. Those early rough trails were Coyote Canyon, Yaqui Pass and the Truckhaven Trail, which at that time was a 30 mile rough road passing over hills, washes and mesas taking 3-4 hours to traverse. It was Doc Beatty who first conceived the the idea of a wagon trail along the base of the Santa Rosa Mountains south to the Badlands and old Hwy 99, emerging near the truck spot known as Truckhaven. 1949 – The first Anza Jeep Cavalcade formed for the purpose of promoting the concept of a 17-mile road into Borrego, Montezuma Valley and onto Warner Springs was approved by the State Park Commission. 1957 -The State Committee consented to the construction of a paved road, which followed the general direction of the old dirt Truckhaven trail wherever possible. It was named the Borrego-Salton Seaway or more commonly known as the S22. It was completed in 1968 and leads so many of us to the Desert Safari each year. team of local men with CB radios explored the area and ultimately became intimately familiar with the entire area, breaking new trails and figuring out how to traverse the notches, hills and valleys thru their rescue work. Several members started focusing on adventure and exploration and two of these early pioneers, Roy Pruitt and Bozzy Willis. Bozzy Willis ultimately formed the nucleus of the club they named Tierra Del Sol and created the artwork that is still seen today on all the members vehicles. 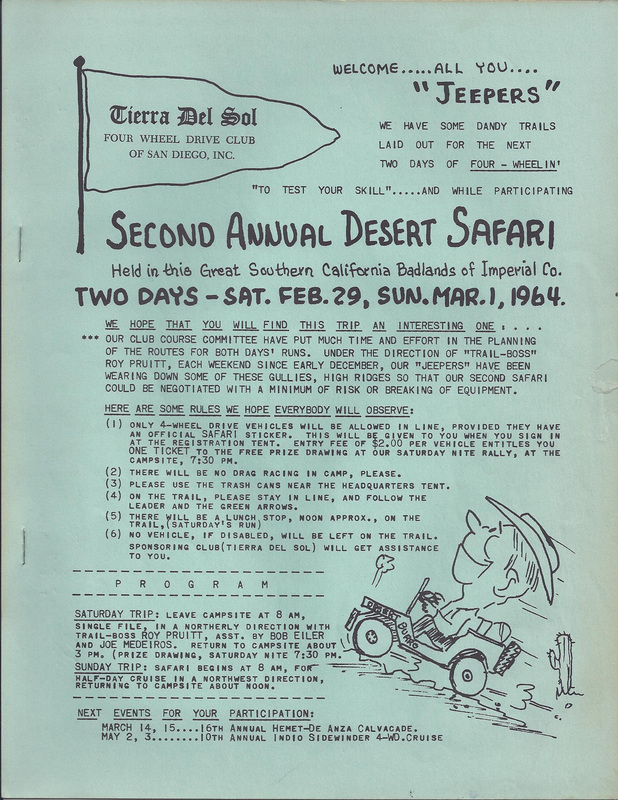 The club was incorporated as a not-for-profit club in 1962 and the annual Desert Safari was born. Proudly the rosters of TDS still contain family names from the origins with generations following in their forefathers footsteps aspiring to protect these lands for our continued use. Albeit a never-ending battle, the families and members of Tierra Del Sol continue to enjoy the area and work hard to preserve it for the enjoyment of future generations.